LayoutManager is responsible to arrange the components irrespective of the platform, as per the size and position required in the fixed area. LayoutManager asks every component about the space required for them in the AWT Layout to avoid the inconvenience when a window is resized. To perform this action, it calls getMinimumSize(), getMaximumSize() and getPreferredSize() methods. Basically, there are two types of interfaces for LayoutManager. 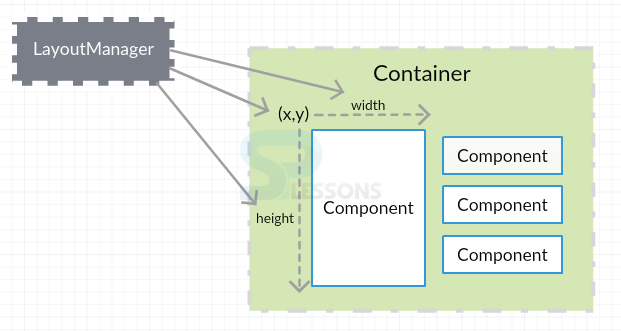 When a container is created, a default LayoutManager is assigned such that it supports every component of that container. A new LayoutManager can be set by using the method setLayout(). Container approaches the LayoutManager by using doLayout() method to re-arrange its components. This is done after first validation of components. FlowLayout arranges the components from top to bottom and left to right with the preferred sizes on the screen. 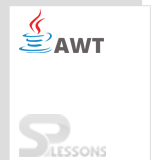 LEFT, CENTER, RIGHT, LEADING and TRAILING are the five constant alignment classes used by FlowLayout. This arrangement is done in rows. If a row is filled, then the control goes to the next row. FlowLayout is made default when used with Panels or Applets. By default, the gap between the components is 5 pixels. Component position is aligned to CENTER by default. FlowLayout() : Creates layout of default size. FlowLayout(int align) : Creates layout of given size. FlowLayout(int align, int hgap, int vgap) : Creates layout of given alignment with horizontal and vertical gap. 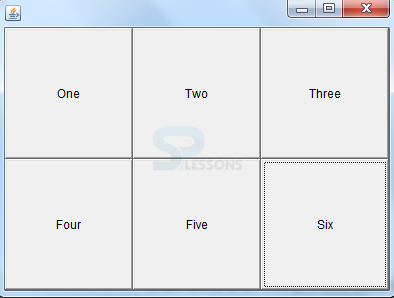 Grid AWT Layout arranges the components in grid cells as rows and columns. The position has to be mentioned. 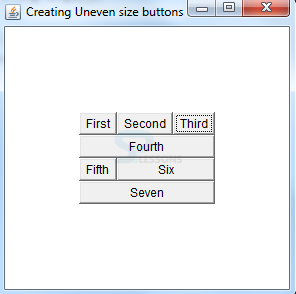 To have unlimited components in a certain row or column, set its size to zero. The arrangement is done automatically in a serial order. Every cell or the component is of equal size. The gap between the components is 0 pixels by default. GridLayout() : Creates AWT Layout with one row and infinite columns. GridLayout (int rows, int columns) : Creates layout of given rows and columns. GridLayout (int rows, int columns, int hgap, int vgap) : Creates layout of rows and columns with horizontal and vertical gaps. 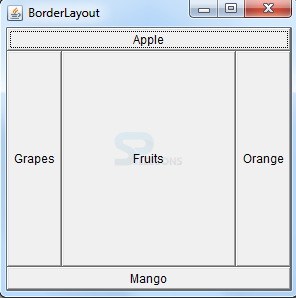 BorderLayout arranges the components as per the given borders(NORTH,SOUTH,EAST,WEST) and Center. This AWT Layout requires name and position to lay the components. These five spaces are expandable and are only possible by BorderLayout. Multiple components can be made fit by using this AWT Layout. Frame, Dialog, FileDialog, Window and Container has BorderLayoutManager as default LayoutManager. 0 pixels is the default gap to be maintained between the components. Scrolling of the screen can be done using this layout. BorderLayout() : Creates layout with default sizes. BorderLayout (int hgap, int vgap) : Creates layout with the given horizontal and vertical gaps between components. GridBagLayout is very flexible and consists of extendable rows & columns. Using constraints, one can position the components as per the requirement. Here, a single component can occupy multiple cells. gridx,gridy Indicates the position of the component in the grid. gridwidth, gridheight Indicates the size of the cells. weightx, weighty Indicates the expandable container area. ipadx, ipady Specifies the padding between the borders and components. fill Functions when the component coverage area is greater than the component size. anchor Specifies the position of component when an extra room is allotted within the given space. insets Indicates the left-out space between the Components and borders. CardLayout is used to display a single component at a time among multiple components. This layout helps in saving the space. CardLayout() : Creates a layout object of default size. CardLayout(int hgap, int vgap) : Creates a layout of given vertical and horizontal gaps. LayoutManager arranges the components in the form of layouts. LayoutManager and LayoutManager2 are the interfaces. FlowLayout goes from left to right in the alignment. Grid cells with rows and columns are present in the GridLayout. BorderLayout is the default LayoutManager for Windows. GridBagLayout is a resizable AWT Layout. CardLayout outputs only a single card at a time. Absolute positioning of components is not a good practice as it may not work well when used on different platforms that have different minimum sizes. And, the interface portability may not support the changing conditions.